I have a very special pick for my Throwback Thursday read this week! 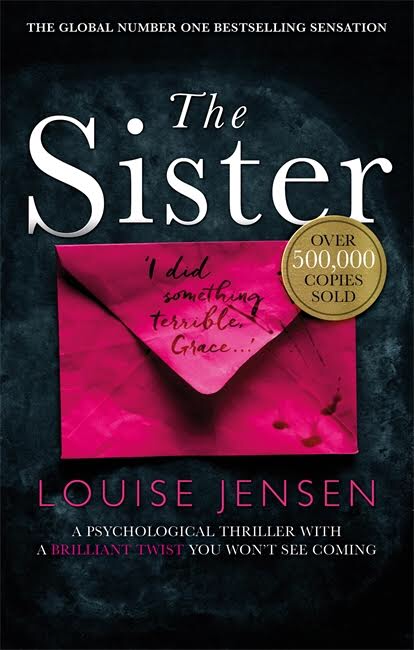 Last summer I was so impressed when I read Louise Jensen’s debut, The Sister and a year later she’s one of my favorite authors, I loved The Gift as well and can’t wait for her newest book to be released soon. Today The Sister is being released in paperback and in honor of that I’m sharing my review again. This book is not one that instantaneously grabs you and doesn’t let go. No, instead it slowly pulls you in until it has you right where it wants you. And then, BAM! Twists and turns galore. While it’s not a book where you are flying through the pages at warp speed, you are still slowly and methodically pulled in to this fascinatingly concocted novel. Told from two different times; Then and Now, you know that Charlie is dead but you have no idea how she died. Was she murdered? Did she simply vanish? And why is Grace so overwhelmed with guilt? Grace thinks she may be going crazy. Or is she? She feels like someone is constantly watching her and she swears she keeps seeing a red car behind her. In her grief stricken state after the devastating loss of her best friend Charlie, Grace isn’t actually sure about anything. She is extremely innocent thinking and naïve, yet I still found myself caring about her. There is a vulnerability and tenderness surrounding Grace that tugged at my heart strings. She has very childlike qualities, especially in the scenes with her absolutely precious grandparents. Her boyfriend Dan, while so annoying to me, was very protective of Grace and I can see why. She has that air about her, as if she’s always a bit of a damsel in distress, moments away from needing to be saved. Lexie is Charlie’s train wreck of a mother. My god how I loathed this woman throughout many parts of this book. She’s a cruel drunk, but although there were relatively few times I felt sympathy towards her, I admit I did. Her life hasn’t been easy. Then there is Anna, Charlie’s long lost sister. From the minute she was introduced she gave me a single white female vibe. I mentioned Dan earlier, and I really wanted to like him. I can’t. I don’t wanna say much more about these characters as it would spoil the plot twists, however if you’re anything like me you won’t trust any of them for a second. The suspense in this book is a slow build up and I was playing guessing games the entire time that Grace’s life was torn apart and ruined. I made many incorrect guess along the way but that thrills me! Quite proud of myself for having things all figured out, then whoops totally wrong. Onto the next theory. If you like an intense psychological thriller, give this book a try. A few times over the past couple of days while reading this I had to look over my own shoulder to make sure I was not being watched. Always a good sign of a suspenseful thriller if I feel this way! I loved this book! Great pick!